The RAC Travel Service, in 1960. Homepage. This page: A 1960s publication issued by the Royal Automobile Club describing the RAC's organised tours. The RAC Travel Service Ltd. This isn't the first time that a publication issued by the RAC, describing a suggested motor tour that members might be interested in, has appeared on OCC. That 1930s leaflet, to be found here, suggests a number of enjoyable routes that could be found around Betws-Y-Coed, in North Wales. This latest addition though describes a number of Continental trips that the RAC had organised, for motorists wishing to tour foreign soil in their car. The publication dates to 1960, and the cover features a pair of magnificent old Bristol Superfreighter aircraft, as operated by Silver City for their airborne "car ferry" service. They operated between the UK and France, enabling motorists to have their vehicle speedily transported to the Continent. In this image, a Ford Consul Mk2 is shown negotiating the loading ramp of one such Bristol. Travellers using the RAC's service could choose either the air ferry option, or steam ship alternative, to transport themselves to mainland Europe for the beginning of their trip. The above publication describes a variety of all-inclusive package deals for motorists wishing to tour Europe, along with notes on the practicalities of driving in a foreign country. One advises that "certain European countries issue petrol at reduced rates for the motorist touring in their countries". I'd not read of such a scheme before, I doubt it proved to be popular with car drivers who lived in these (un-named) countries, who had to pay full price for their fuel, I wonder how long this particularly attractive benefit continued? In those pre-internet days, all-inclusive holiday deals that removed the hassle of booking sea or air travel, finding decent accommodation, and identifying local places of interest to visit, would have appealed to many RAC members looking to reduce the hassle involved in organising an overseas trip on their own. Touring Rally No.1 - to Switzerland and Germany. Trips are classified as Touring Rallies, Car Holidays, or Car Tours. The description for the first Touring Rally on offer gives a good idea of the types of trip that the RAC Travel Service could provide. Day 1, Saturday, would see the car and occupants whisked away from England to France, either by air ferry or steam ship, the latter arriving at Boulogne, while those opting for the airborne option would first touch French soil at Le Touquet aerodrome, to the south of Boulogne. Everyone would then drive South East to Reims, where they'd stay overnight at the Hotel Univers. Following six days of hectic excitement at Interlaken, it was time to fire up the Consul and head off to Baden-Baden, a journey of 190 miles. Two days later, with cases re-packed, a further 213 miles would be covered - destination Cologne, specifically the Hotel Am-Augustinerplatz. No time to take in the local attractions though, as next morning cars would be pointed towards Hamburg, notably referred to as the rebuilt city of Hamburg, some 283 miles away. Two days of R&R at the Hotel Reicheshof, then it was time to don the driving gloves once more and complete a further 241 miles, en route to Arnhem. Friday would require a drive of 204 miles to Ostend, in readiness for a return ride home aboard a steamer to Dover, the final leg of this particular trip. 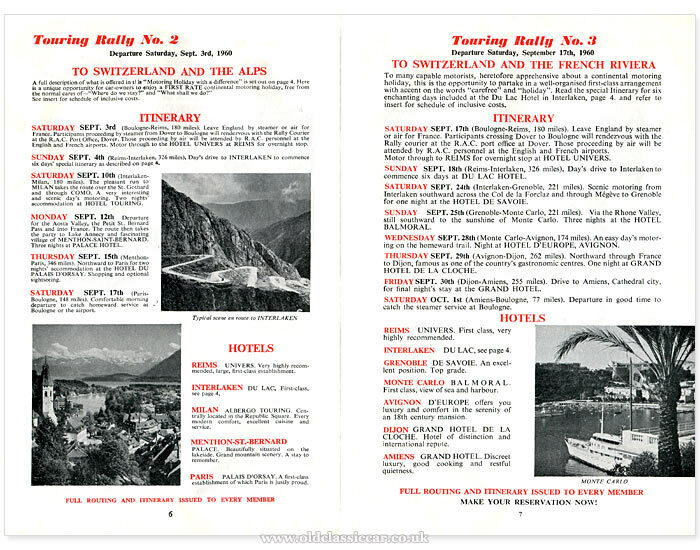 Touring Rally #2 offered a Continental holiday taking in the Alps, while #3 headed down to Monte Carlo. If the mileages quoted sounded a little too arduous to be considered a true holiday, then several shorter trips were also offered, labelled as Car Holidays. The first of these was a tour of Brittany and the Atlantic Coast, during which around 1,000 miles would pass beneath one's crossplies or radials. The second Car Holiday took in Brussels and a visit to the Rhine area of Germany. Drivers might also want to avail themselves of the Car-Sleeper service, which ran between Boulogne and Lyon. This enabled motorists to complete a large chunk of several RAC-organised journeys by rail, with their cars stowed away in a purpose-built carriage in the same train. This avoided 900 miles of driving. The RAC continues to offer all manner of motoring-related services, as do other similar companies. 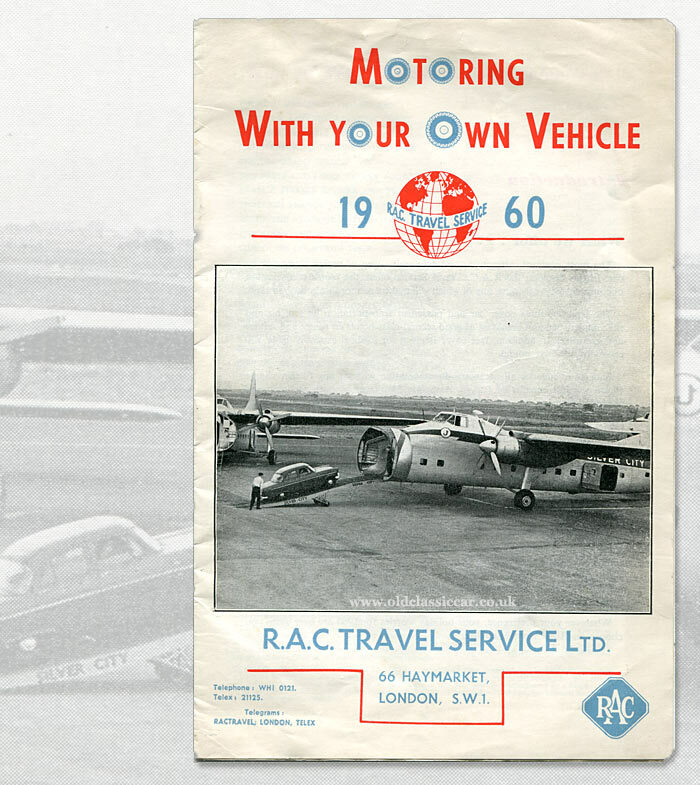 The RAC's website makes no reference to modern-day, all-inclusive, holiday packages of the type described in this '60s publication, so presumably this particular service was dropped at some point. Return to the Motor Collectables section. Here, there are many pages that look at items - mostly printed - that relate to motoring in times past. Quite a number relate to organised motor tours, before and after WW2. For example, this page takes a look at coach trips in and around Cologne, in 1934, undertaken in a particularly impressive coach.